In Britain, men make-up just under 10% of nurses and yet the image of nursing still firmly remains female. So what does it mean to be a man in a female dominated profession? Ruth Simpson (Professor in Management at Brunel Business School) under took research looking at gender roles in employment. She looked at the experiences of men in four different traditionally female dominated professions (these were cabin crew on airplanes, nurses, primary school teachers and librarians). 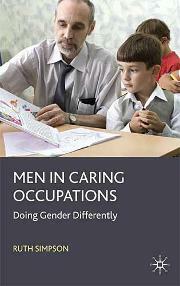 This research forms the second part of this book, the first part is given to a discussion of gender roles in employment. Simpson is a professor in management and this book is very much geared towards managers and management theory, this is not a book aimed at healthcare professional. Also, the choice of the four professions her research looks at seems strange; they are certainly not similar professions with very different experiences of those working in them. �In the last thirty years many more men have entered nursing, so how has that changed the profession? What have been the experiences of both men and women and how has it benefited the profession? This book doesn�t answer these questions for any of the professions looked at. This book does raise general questions about gender roles but we need research and study specifically on men in nursing, which isn�t in this book.